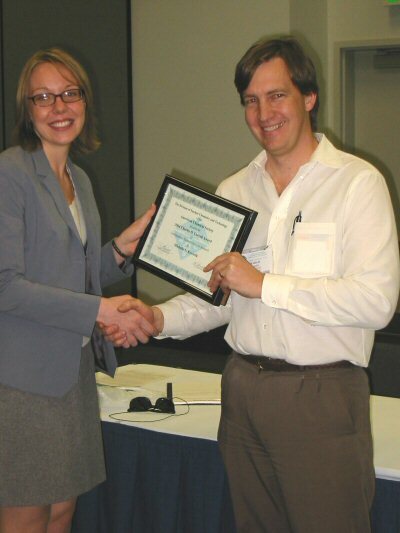 The 2004 Coryell Award winner, Michelle Kovarik from St. Louis University was recognized at the NUCL Business Meeting during the Spring ACS National Meeting. Michelle did her undergraduate research project under the direction of Dr. Michael Jay and graduate student Jim Weekley. Her research work covered the development and application of a nanosuspension liquid scintillation counting fluid. Liquid scintillation counting (LSC) currently accounts for 71% of mixed radioactive, organic waste. Development of an aqueous-based scintillation cocktail is desirable to reduce the amount of mixed waste produced. Polymerization of styrene-in-water microemulsions was used to entrap LSC fluor molecules, 2,5-diphenyloxazole (PPO) and p-bis(o-methylstyryl)-benzene (bis-MSB), in polystyrene nanoparticles to create an aqueous suspension. These nanosuspensions were characterized using quasi-elastic light scattering and transmission electron microscopy and optimized with respect to PPO concentration, surfactant molecule(s), and styrene purification. The nanosuspensions were used successfully to count various aqueous samples, including biological samples of digested blood and tissue. Optimized nanosuspensions yielded counting efficiencies for 14C-acetic acid of up to 46% compared to commercially available LSC cocktail.